The Smith machine, invented by Jack Lalanne, is a weight training equipment containing a barbell fixed between steel rails. The Smith machine, invented by Jack Lalanne, is a weight training equipment containing a barbell fixed between steel rails. This machine is used to perform various strengthening exercises like squats, bench press, rows, seated overhead press, and drag curl. The traditional model of this machine allows only vertical body movement, but the new modified models of the Smith machine allow movements in forward and backward directions too. The weight of the Smith machine is counterbalanced by additional weights present at the base of the machine, which allow the user to lift heavy weights without exhausting the stabilizing muscles. Unnatural body movement:When you perform squats using a barbell on the Smith machine, your entire body moves in only the vertical plane. A more natural form would be to use free weights, which move the body horizontally and vertically. A study compared muscle force produced during squats between the Smith machine and free weights. This study finds that an excessive muscle force was being applied on the Smith machine compared to the free weights. The excessive muscle force and absence of stabilizing backward movement during squats results in the overloading of muscles, tendons, and ligaments, causing microtrauma. The high risk of knee and lower back injury: Squats performed on Smith machines result in an excessive load on back extensors, knee flexors, knee extensors, and plantar flexors. These muscles constantly work in the same vertical pattern; unlike squats using free weights where the hip flexors and back flexors share the load and counterbalance the movement. The repetitive activity of these muscles causes them to experience chronic fatigue, which could result in knee and lower back injury. The faultycenter of gravity (COG): Another disadvantage of the Smith machine allowing body movement in one plane (vertical) is that the stabilizing outward hip movement is unavailable. To stabilize this situation, the feet are moved in front of the body, resulting in a faulty COG around mid-thigh. A flawed COG exposes the spine to injuries. Less effective for muscle strengthening: The counterweights placed at the base of the Smith machine helps to counterbalance the weight of the barbell, increasing one’s capacity to lift weight by allowing the muscles to work less, which causes a decrease in overall muscle activity. 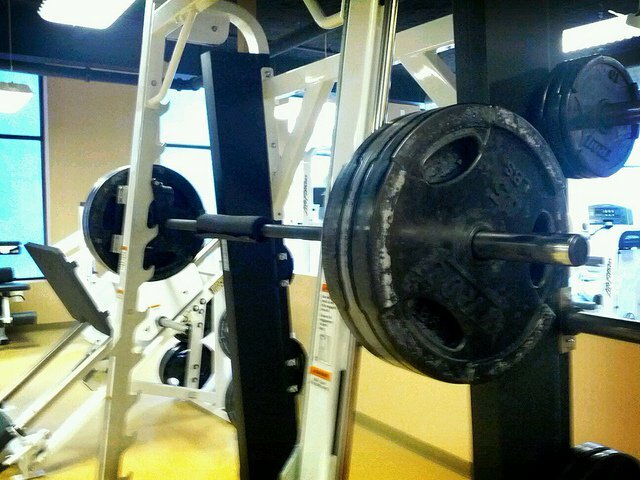 A study showed that there is 43% more muscle activity when squats are performed with free weight than with the Smith machine, meaning that the Smith machine does not effectively strengthen knee muscles. In summary, it would appear from various reports that using the Smith machine exclusively does not help in core-strengthening and ballistics training of muscles. Therefore, a combination of exercises using different machines should be undertaken. Before including the Smith machine in a normal workout, the opinion of a qualified trainer should be sought. Schwanbeck, S., Chilibeck, P., & Binsted, G. (2009). A Comparison of Free Weight Squat to Smith Machine Squat Using Electromyography. Journal of Strength and Conditioning Research, 23(9), 2588-2591. Anderson, K., & Behm, D. (2005). Trunk Muscle Activity Increases With Unstable Squat Movements. Canadian Journal of Applied Physiology, 30(1), 33-45. Schick, E., Coburn, J., Brown, L., Judelson, D., Khamoui, A., Tran, T., & Uribe, B. (2010). A Comparison of Muscle Activation Between a Smith Machine and Free Weight Bench Press. Journal of Strength and Conditioning Research, 24(3), 779-784. Cotterman, M., Darby, L., & Skelly, W. (2005). Comparison Of Muscle Force Production Using The Smith Machine And Free Weights For Bench Press And Squat Exercises. Journal of Strength and Conditioning Research, 19(1), 169-176.